Hello again, my name is JeepCrew. I wrote a guide for Aphrodite in arenas and this is my second guide. Please feel free to comment or message me with any suggestions in regards to the structure of the guide. My IGN is Mattelite. I started playing this game about 4 months ago and Ares was the first god I unlocked. I have since grinded my way up to 7 masteries with him. It's been tough. Before I had any feel for building and counter building, I racked up so many deaths that I have just now broken even in terms of K/D Ratio. Ares is unique. He plays differently than any of the other guardians. In this guide, I will be going over items that I personally think work best for Ares and will list some good situations to pick them up. I will attempt to be as in-depth as I can. Forgive me if the formatting isn't perfect. If this takes off, I may try and consolidate it all into a video. Let's sound the drums of war! Everyone loves Sovereignty. Giving all of your allies a pretty sizable boost to their protections is always a good thing. Personally, I don't pick this up a lot. I like the item, but it's a very popular pickup for warriors. The aura doesn't stack so it would be a waste for two teammates to get it. That being said, if you have enough gold and are up against a mostly physical team comp, this is a fantastic item in any game mode. Another great item that is commonly picked up by warriors, but the aura stacks for this one. This item shines in long engagements. In a 10 second team fight, this item will deal 400 damage to every enemy near you. Great item to pick up early as it will help tremendously with your clear. This is a great conquest item. I LOVE this item. It provides a very good debuff to any physical character and a decent one to AA mages. For me, this is a core item. Good for any game mode. The only thing that could make this item better would be some health. Even if the opposing team has only one physical character this is a great option. This is the one item I think everyone can agree should be core on Ares. 70 magical power (because of his passive), 50 magical protection, AND magical protection reduction. Seeing as you'll be spending so much time near enemies, this will provide a sizable boost to any of your magical allies. This item is core in any game mode. Pick it up. I'm not in love with this item. It can be a good pickup in conquest if you're laning against an Aphrodite + ADC combo. It's also a decent item to pick up in arena if you're up against Aphrodite, Chang'e, or Hel. I like the base stats on this item but I don't think the aura is powerful enough to warrant picking this up. Situationally this item can be good but 80% of a healing spell is still pretty good for the other team. I would take Weakening Curse over this. This is also an item I have picked up very rarely. I only ever get it when I'm up against an all physical, or all magical team. It gives you a big jump in magical power and helps a bit with sustain. I don't like this item. The protections are good and the cooldown reduction is great but the mana is not a good stat to augment. Ares is not a very mana-hungry god. The one positive thing I can say about this item is it brings simplicity to your build. This item is amazing. Health, physical protection, and a passive that heals you every time you get a kill or an assist (you should be getting these constantly with Ares). Great in arena because kills and assists are so constant. AMAZING in conquest because it gives you much needed sustain. Passive: You gain an additional 15% damage mitigation for 3s whenever you are hit with a hard crowd control ability. This can only occur once every 10 seconds. This item is the king of cooldown reduction items as far as I'm concerned. The passive alone would be enough for me to pick up this item. As Ares, your inherent tankiness and insane damage output makes you a HUGE threat in any engagement. Enemies are very likely to blow all their CC on you whenever they see you approach. This item makes that a non-issue. If you want cooldown reduction, and magical protection, this is the way to go. Do I even have to say anything about this item? It's the first item I pick up in every game. Period. Get. This. Item. I never get this item on Ares. I think it's a good item though. If you want to work this into your build go right ahead. Another AMAZING cooldown item. This item shines against team comps with lots of slows. The health, attack, and movement speed are also great. This is a good item to work into your build. This item has saved me from death countless times. A good substitute for Pestilence in most situations. Good in all game modes. Great item. Just Great. Gives a good amount of health, decent over all protections, full crowd control reduction, and beads every 45 seconds. I don't pick it up often because Ares has crowd control reduction worked into his kit but this item is worthwhile. It also procs with Spirit Robe. I think this is the best defensive item in the game. 65 of each protection is huge. It also provides a decent boost to your health and mana. If you would be willing to forsake a bit of damage for more durability this is the way to go. Great item to pick up in arena and conquest. It sets up your ultimate VERY well. I prefer this over Combat Blink for its much lower cooldown. I don't really use this as an escape very much. I pick this up when I'm up against a team with a lot of slows. This item will save your *** more often than you know. Always a good pickup. A minimum of two aura items. 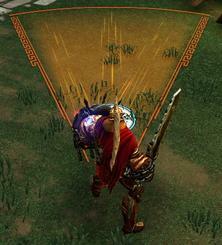 ares]' passive grants him 30 magical power for every completed aura item he owns. I see a lot of [[ares players building four or five aura items. That's really not a good way to go. There is only one aura item that provides magical protection. You should have at least two stacks of his passive but don't get carried away. Building too many aura items is going to limit your overall utility. Protections, protections, protections. You need these, people. They are your last line of defense. Ares does not benefit from a high power build like Ymir, Athena, or Hades. He's not bursty enough to be a mage-like guardian. He also gains power from some protection items. I would say a minimum of 150 of each protection is what you should be shooting for. A minimum of 25% cooldown reduction. Ares is not all about his ultimate but it is a huge part of his team-fight presence. You want to increase his chances of actually pulling in your enemies. The best way to do that? Cooldown reduction. I usually end up with 35% but 25% puts you well under Greater Purification cooldown. It also helps that a lot of cooldown items have great passives for survivability. A minimum of two movement speed items. This one might seem silly but I firmly believe that movement speed may be the most crucial stat in this game. Team-fights are all about positioning, zoning, and mobility. Knowing how to maneuver and doing it quickly is more important than protections. Your enemies can only harm you if their skills and attacks actually land after all. Your main source of damage and CC. At max rank doing 105 + 15% of your MP upon landing and that same damage per second for four seconds. You get to fire another shackle, within 2 seconds, for free if you hit your target up to 3 total shackles. Your shackles also slow your enemies by 15% and boost your speed by 15% per unique shackle you hit. This also prevents any movement abilities. The proper technique with these is to wait just under 2 seconds to fire of the next chain. If you want to burst down an enemy faster, you can shoot them off in quicker succession. Just remember: patience is a virtue. Taking the time to shackle three enemies and do considerable damage to all of them also works well with your second ability. I max this first. A good defensive buff for you and your allies. 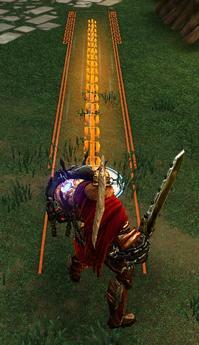 At max rank it provides 40 of each protection in addition to 7 for each enemy you have shackled. It also provides 30% crowd control reduction so, if you're up against a CC heavy team, this should always be active. I max this third. 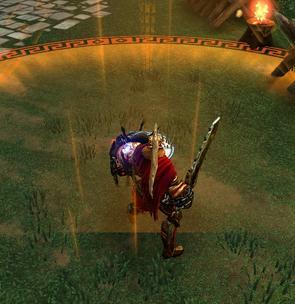 Flames pour forth from Ares' shield, engulfing enemies in a cone in front of him damage every .5 seconds for 4 seconds. Ares is immune to knockback for the duration. This is your clean-up ability. After shackling one or more opponents you bring them down to, or very close to, death with this ability. It also provides knockback and knockup immunity. I max this second. This is somehow the best, and worst, ultimate in the game. Greater Purification, Aegis Pendant, or any cc immunity counters the ultimate almost entirely. It's why cooldown reduction is such a huge factor for Ares. I leave this ability at rank one until I have everything else maxed. The stun duration is the same at all ranks and the damage is not substantial enough for me to put points in this until the endgame. I hope this helps all of you Ares fans out there. Please feel free to make suggestions or ask questions. I'm always happy to hear from fellow Ares players. Have fun ruining people's days. I know I do. Major credit to Mattelite. He created all of the content and opinions of this guide. Jhoijhoi. As with most new guide writers, I couldn't have made this without the help of her guide(s). Interesting strategy, I like it. -A little more BBCoding, so you don't just have wall of text followed by another, and it adds a little emphasis to important parts of your guide. -Just....please check spelling. It's Bolster Defenses, with an "s". Proofread you guide regularly to catch any new or old mistakes you may have made. -I have a question as to why you don't level his ultimate? The damage increase is helpful, especially if you're building him for some damage to take advantage of his passive, which I don't believe (correct me if I'm wrong) you ever actually mentioned. Otherwise, this is a great start and really helpful for Ares players who are just getting started! Check out some of TormentedTurnip's guides on BBCoding and Guidecrafting, he has some really helpful stuff! 62204 MaddJack Interesting strategy, I like it. Just a few pointers from someone with (considerably little but rapidly growing) experience on [color=#ffff00]guidecrafting[/color]: -A little more [color=#00ffff]BBCoding[/color], so you don't just have wall of text followed by another, and it adds a little emphasis to important parts of your guide. -Just....please check spelling. It's [[Bolster Defenses]], with an "s". Proofread you guide regularly to catch any new or old mistakes you may have made. -I have a question as to why you don't level his ultimate? The damage increase is helpful, especially if you're building him for some damage to take advantage of his passive, which I don't believe (correct me if I'm wrong) you ever actually mentioned. Otherwise, this is a great start and really helpful for Ares players who are just getting started! Check out some of [color=#00ff00]TormentedTurnip[/color]'s guides on [color=#00ffff]BBCoding[/color] and [color=#ff0080]Guidecrafting[/color], he has some really helpful stuff!